Once upon a time, I read a large collection of stories of Sherlock Holmes’ contemporary competitors. They were without exception predictable and creaky, although recognisably from the same period – much like Dussek compared to Beethoven, or, dare one say it, Salieri and Mozart. It was easy to see why Holmes and Watson remain endlessly re-read and celebrated, and the others totally forgotten. Frank Tallis, on the other hand, need fear no comparison as a latter-day Conan Doyle. Max Liebermann, like Holmes, is an unofficial consultant to the police, although his friend Inspector Rheinhardt is a good deal more genial than Lestrade, or Holmes’ other police associates. He ‘lives’ in the same period (1902, as against the Holmesian 1880-1914). Like Holmes, who played the violin at moments of reflection, Liebermann, whose day job is as a practitioner of the infant discipline of psychiatry, is musical. He plays the piano; indeed, where Holmes made his famous tour-de-force deductions when Watson and importunate clients rushed into his front room, Liebermann reads Rheinhardt’s unconscious from the run-throughs of lieder they periodically enjoy together. At moments of perplexity, Holmes consults his enigmatic brother Mycroft, a still more gargantuan intellect. Lierbermann’s equivalent is none other than Siegmund Freud, his mentor for his own developing psychiatric career. As a genre, the detective novel must be as enjoyable to write as to read. It is always in fashion and it is the most knowing of literary genres; it is after all about clues, clues that the hero must solve, but also that the reader can himself pick up. And clues are hints, allusions, or, to use the psychotherapeutic term, suggestion. The author is all-knowing; he not only constructs the detection for the hero, but also sows seeds to aid – and of course mislead - the reader. Further, those generic allusions such as the Holmesian references above are by definition neither plagiarism nor irrelevance; they are part of the intellectual texture of the crime novel. Tallis writes both dialogue and description in a consciously (and successfully) old-fashioned vein. Despite the wealth of detail, Tallis' light touch is one of the pleasures of this novel. Several descriptions of duels, in particular, are marvellously atmospheric. As for music, it is an adornment, not a structuring principle, in the book. The murderer takes The Magic Flute as his template, but its freemasonic overtones are more significant than its Mozartean quality. Otherwise, music figures prominently simply because it was a key component of Viennese culture. Equally important, and equally convincingly described, we find incipient Nazi German nationalism, the commercial Jewish bourgeoisie, the birth of psychiatry and above all, the coffeehouse and its menu. 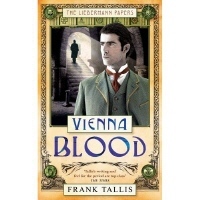 Vienna Blood is the second in a trilogy; in stylishness and assurance it surpasses its estimable predecessor. In Mortal Mischief, some of the set pieces might be said to tread the wrong side of the line suspending disbelief (although it would have been hard, for example, to resist using the Ferris Wheel for an important scene). In this second book, however, Tallis’ plotting is deft, but, even more impressively, he effortlessly interweaves the story as such and the dramatic, but historically real narratives that surround it – the struggle by psychiatry to gain acceptance, the undercurrent of anti-Semitism, the artistic commitments of the Secession and of 'traditional' artists. Vienna Blood is an excellent read, the story rattles along, the scene painting is exemplary; I eagerly await the next volume. * The auhor confirms that it is a typesetting error which will be corrected in the paperback. Papageno should read Papagena!